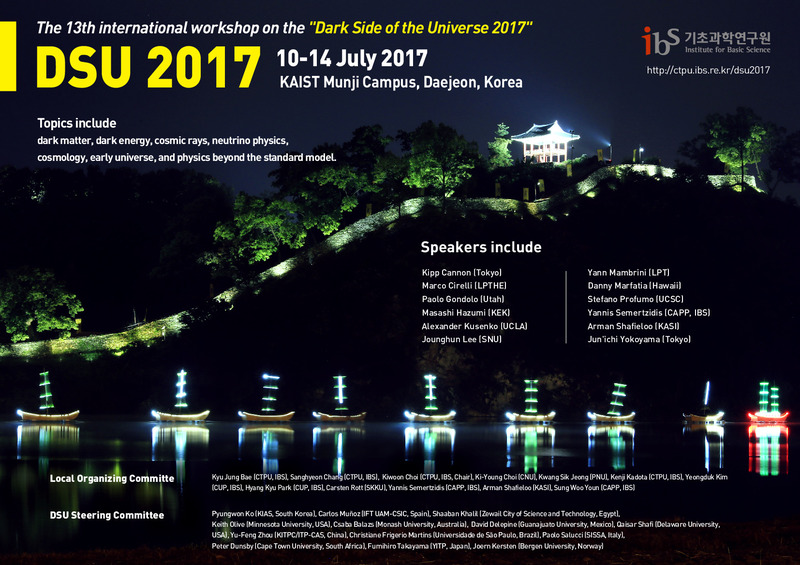 The 13th international workshop on the "Dark Side of the Universe 2017" will be held at the Institute for Basic Science (IBS), S. Korea. The Dark Side of the Universe (DSU) workshops bring together a wide range of theorists and experimentalists to discuss ideas on models of the dark side, and relate them to current and future experiments. Topics covered include dark matter, dark energy, cosmic rays, neutrino physics, cosmology, early universe phenomenology and physics beyond the standard model. DSU2017 is supported by the Institute for Basic Science and jointly hosted by Center for Theoretical Physics of the Universe (CTPU / Particle Theory and Cosmology Group), Center for Axion and Precision Physics Research (CAPP) and Center for Underground Physics (CUP).